✅ Trip Verified | Barcelona to Rome. The agent made us check the weight of every single bag we had, even hand bags, we consolidated and reconsolidated, checked 3 bags and paid the extra costs for the bags and still Alitalia lost our luggage. Worst customer service, they could care less that your luggage is lost and do nothing to even try to help. How does no one know where my luggage is and why are the customer service agents so horribly trained. 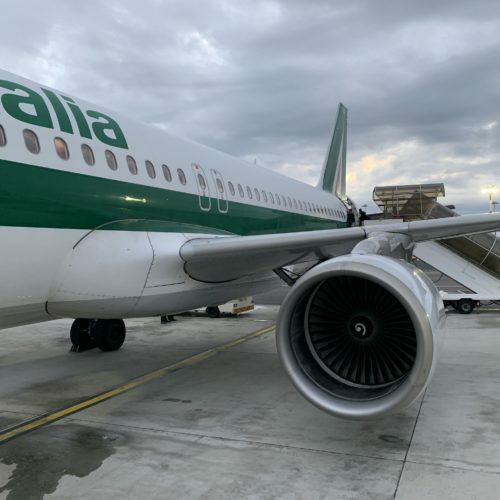 "looked like they would rather have been elsewhere"
✅ Trip Verified | This was my second time flying with Alitalia to Johannesburg and I have to say that the first time was better than this. The aircraft were all clean and the crew from LHR to FCO were pleasant enough. However the all male crew to Johannesburg, although not rude, tried very hard not to interact with the passengers. I saw one flight attendant smile the whole flight. It is sad that the crew all looked like they would rather have been elsewhere. During the night there was not a sign of them and compared to other airlines that really lets them down. ✅ Trip Verified | Amsterdam to Athens via Rome. Alitalia currently offers by far the cheapest deals in premium segments and so I booked another roundtrip to ATH, like I did last year. The flight also offered me 60 XP at a bargain. Hard and soft product more or less same as previous flights. This time I pre booked a Seafood meal and certainly did not regret. Meal was of much better quality then the standard Pasta dishes. Alitalia offers a hotel on all segments (ATH-FCO is just 1h35). Staff friendly and lounge in ATH is very good. Sky Priority well organized. All flights on time except last flight into AMS minor delay due to heavy wind at AMS. Crew has nice new uniforms. Also in economy I noticed they still offer some basic service, a nibble and a beverage on all flights uphill 3hrs. WiFi available Will certainly fly again! ✅ Trip Verified | Frankfurt to Florence via Rome. We will never fly with Alitalia again. We arrived at the airport in Germany with plenty of time to spare and got stuck in security. When I say stuck, I mean we stood in line not moving for almost an hour. We got to the gate and they would not let us in, nor would they help us rebook. This cost us $1400 to book through another flight and a hotel for the night. "a very comfortable way to fly"
✅ Trip Verified | Alitalia's Premium Economy is a very comfortable way to fly. 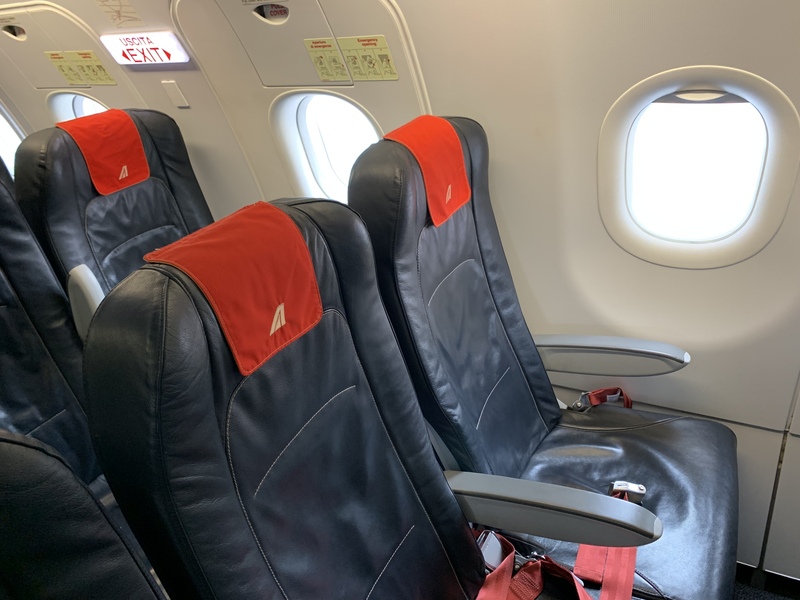 On our recent trip from Amsterdam to Cape Town, we booked Premium Economy and - good to know - unlike others, Alitalia will put you in Business Class on connecting flights that don't have Premium Economy. A huge step up from many of the other airlines that will seat you in Economy. So those flights come with complimentary lounge access. Lounge in Amsterdam provided by KLM, which is just OK. Business class on board Alitalia is pretty standard but seats do have adjustable armrest that create a slightly wider seat, ample pitch and a little table in between seats that folds down. I was quite impressed with the catering, a traditional set up with a good pasta, salad and dessert. Service was fine. Connection in Rome is really easy as you are leaving the EU (no security). Our flight to JoBurg left on time with an early arrival. This is important because if the flight is late it will be handled at a remote stand, which easily adds 30 minutes to getting through the arrival process. Alitalia's premium economy is wonderful. Really comfy seats with great recline, quite adequate for sleeping. Avoid the first row, because leg space is really reduced there. seats are in a 2-3-2 arrangement with 2 rows on the side and 3 in the middle. Second window row is really the best. A nice amenity kit was handed out, pre departure bubbles in plastic cups. Meal service was upgraded and somewhere in between economy and business class. Proper linens, china and silverware were used. 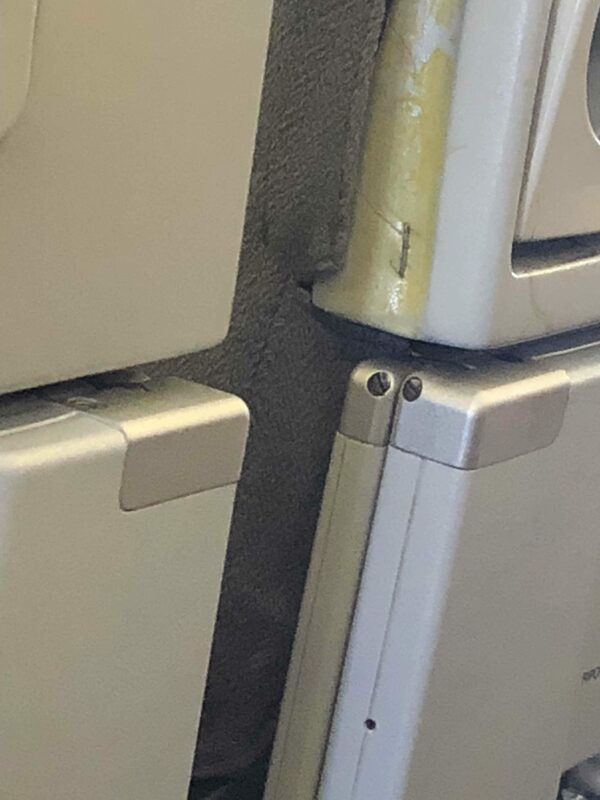 I had a great sleep on this flight. Breakfast was very basic. Service from the staff could be warmer, but nothing to get upset about. Arrival in Joburg was okay with a short wait at immigration. 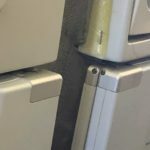 Alitalia sells a connection to Cape Town (which we took) on SAA, but they 'don't partner' which means if anything happens that will make you miss your connection they will point fingers to each other. We made our connection but trying to make some sort of a change in the trip was impossible because of this. ✅ Trip Verified | We returned from Cape Town to Amsterdam via Johannesburg and Rome. The first sector was on SAA. Johannesburg is a tricky airport to transfer from domestic to international. Terminals are far apart and it requires re-check-in, security and passport control, then more long distance walking. Our 1H30 connecting time just got us as last passengers onto AZ's flight to Rome with minutes to spare. The club cabin on AZ's A330 is nice with incredibly comfortable, private and spacious seating. All window seats are singles, slightly staggered so some are closer to the windows then others, but all allow for good views from the windows. AZ's amenity kit is gorgeous. Proper printed menus for food and wine were handed out. Pre-departure bubbles, water and juice, international papers followed. Although AZ's pillow is of disposable quality the pillow case is beautiful and the blanket is fine too. AZ is obviously taking on-time performance seriously. All our flights left spot on time or early. Dinner started quickly after take off. Alitalia sets individual tables (no trays), this gives almost a First class feeling. Beautiful linens, glass and silverware. Dinner is a five course affair of solid quality. The pasta dish was gorgeous (and a full meal by itself). So far AZ's product is with the absolute top. The only aspect that could be better is the staff. They are so 'rough around the edges' and most interactions are 'rusty'. They are okay but not overly friendly or proactive. It seems they avoid interaction. What a pity because this created a rather 'frosty' atmosphere in the cabin. 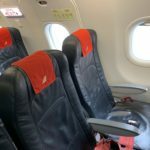 The purser did not make any effort to interact although she was constantly in the cabin with paperwork, dealing with her team as if we were not there. No welcome, 'how are you' or goodbye's from her. Sleeping on board is fine although the cabin was too hot, luckily window seats have individual vents. Seats in the middle don't so I would avoid those seats. Breakfast was rather 'Italian' with no options and sweets only. Also breakfast was served in total darkness, which I gather is not a problem for passengers (who have individual lights) but I guess not ideal for the staff. Arrival was on-time but Rome airport was it's usual mess. 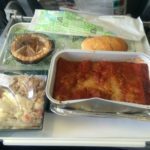 We enjoyed our Alitalia flight and recommend it. ✅ Trip Verified | Flew back to Brazil in Alitalia Business class. Short hop from LHR to FCO was nice, all good, lounge at Rome is as good as any in the world simply because its food is great! The long-haul flight back to GRU was same type of aircraft as the outbound and similarly "tired". Very old entertainment system even in Business class. I do like Alitalia's flat bed seat, I do find it very comfortable. Food was not up to scratch. The menu was quite limited and uninspiring for premium cabin. Campari was great as always. The pasta was a little burned, the fish was tiny and of poor quality. 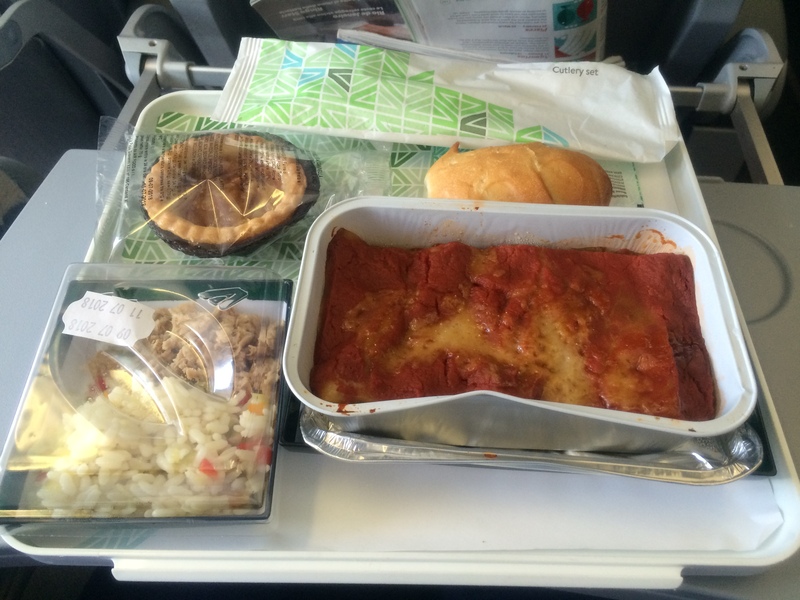 I was very disappointed as I have always raved about Alitalia's food. The flight was very uncomfortable as there was a lot of turbulence, I was unable to sleep at all. I felt the pilot could have done more, he "cruised" at the same altitude for from the third hour of the flight when in my experience others have tried to look for more comfortable reaches, maybe there were ATC considerations, I don't know, but it was a pretty horrid flight and I did feel a lack of consideration from the front. ✅ Trip Verified | So these 777 that Alitalia now fly are getting quite tired. Seats in economy are very hard. I had a "comfort" seat on the long-haul flight from Sao Paulo to Rome so I had extra leg room. I got mine for free as I am platinum with Air France, however otherwise it would have cost US$150 and consequently I imagine those that did pay would have been outraged that staff allowed people to move to vacant exit seats after take off. The meal was satisfactory and probably above average for airline food. Entertainment system very old, but a couple of good films so job done I guess. Thankfully I had the prospect of lunch in one of my favourite lounges (Rome) in the world to cheer me up as I crossed the Atlantic. The flight was cheap, for the price good value albeit even in "comfort class" not very comfortable. ✅ Trip Verified | Rome to Pisa. My first experience with this company was really bad. First, the flight is delayed for one hour and the second I haven't received my baggage and still waiting to be found. ✅ Trip Verified | Berlin to Rome. I had Flying Blue points to redeem so I used them for my flight from Berlin to Rome. I was a bit apprehensive at first with Alitalia being in receivership after having been ditched by Etihad. But I proceeded anyway knowing that in the unlikely event that the airline goes belly up, I still have other options. As with most intra-European flights, Alitalia offers basic snack service on board. A drink and a snack, either sweet or salty was being served on this 2 hour flight. As I was seated in the exit row, leg space was generous. Seats were leather seats in black. Flight attendants were smartly dressed in black pant suit with scarf emblazoned with Alitalia colours.